To connect via CDC-UART, start a terminal emulator and connect to the used COM port. There is a wide variety of terminal emulators that you can use, for example, Termite (GUI-based, Windows only) or PuTTY (GUI-based, available for multiple operating systems). The following instructions show how to configure Termite correctly. Other terminal emulators can be set up in a similar way. Download and install the latest version of Termite. Connect the development board to your computer. Open Termite and click Settings. Select the correct COM port to connect to the board. Go to the start menu in Windows and type devmgmt.msc to open the Device Manager. Scroll down and expand Ports (COM & LPT). Find the port named JLink CDC UART Port and note down the number in parentheses. If you have more than one J-Link UART port, unplug the one that you want to use, plug it back in, and observe which one appeared last. Configure the baud rate and the flow control. Use the default values for the rest of the settings (8 data bits, 1 stop bit, no parity). By default, the SDK uses a baud rate of 115200 and RTS/CTS flow control. 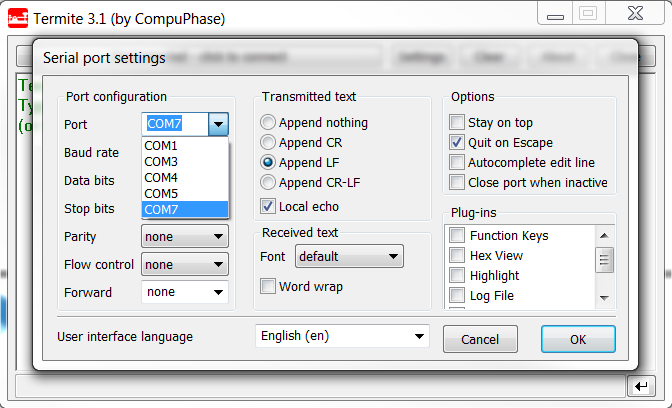 Make sure that Append LF is selected. This option appends a newline character to any text that is sent. Go to Settings > Plug Ins. Enable Status LEDs and click OK.
Click on the dark green rectangle above RTS to set this signal high. The text Start... is displayed in Termite. Alternatively, you can turn off hardware flow control in your application.